Bloodline/Relatives/Relations: Five older sisters (Rye (aged 19), Sol (18), Ett (17), Phi and Chi (twins, 16)) and one younger sister (Cal (14)). Their parents are frequently absent, so Rye raised her sisters and is essentially their mother figure. Weaknesses: Normal human weaknesses; a slightly greater weakness to iron and steel - prolonged exposure will sap Vie's powers, and blows landed from either material will harm her more than they would harm another human. Her wings are easily damaged and take a long time to heal completely. Weapons: None, other than maybe her gardening tools. They're probably not very effective in a fight though. Personality: Gentle, sweet, and stubborn. Vie is difficult to anger; she speaks and moves with softness and elegance, and holds herself well. She's very gentle in everything she does, and very kindhearted. She's also deadly if angered, and will hold a grudge until she can get her revenge. If Vie wants something, she'll get it eventually, no matter what she has to do or how hard she has to work to get it. She's also very aware of her own prettiness, and isn't above using it to get her way. Background: Vie was born to a quite wealthy family, with parents who were away a lot of the time. Her eldest sister, Rye, stepped up to be a stand-in mother to her younger sisters. Rye strongly encouraged independence in her sisters and Vie took well to this lesson. It made her headstrong and fierce, with the determination that, if there is something she wants, she will get it, no matter how much she has to work for it. Over the years, Vie learnt how to use her innocent appearance to get people to do her bidding, and her status as Rye, and later Sol's, younger sister if she had to intimidate them into it. She does well in school and is used to being the girl that everyone in her year has a crush on. Vie has modelled in her spare time, often with her sisters, and is really rather good at it. She discovered her powers at a very young age, using them to grow her little flower garden. Her older sisters were aware of them before she even really was, and supported her in learning to hide them; they had practise, since her older sister Ett possesses the same powers. All of the sisters have wings, and have learnt how to hide them through years of trial and error. Appearance: With long, fiery orange hair down to her midback, usually styled in some beautiful and classic style, or else left to fall in its own natural waves, Vie is incredibly pretty. 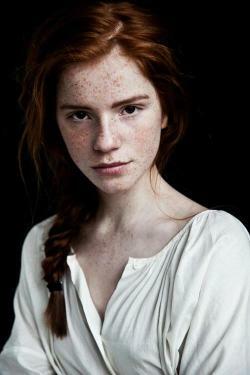 A galaxy of freckles is spread across her face, and there's a smattering of more of them across the rest of her body. Her eyes are a soft and warm brown, and she is often granting the world one of her gentle and kind smiles, as she drapes herself elegantly against whatever or whomever she happens to be close to at that moment. Her voice is very soft and sweet; she barely ever raises it at all. Her usual attire is summer dresses - long, flowy, and frequently floral ones, in light colours. Sometimes she pairs them with pretty flats or heels, but just as often with leather or combat boots; in colder weather, she'll often be seen sporting a jacket stolen from one of her older sisters. She's a little on the short side, standing at about 5'2", mostly thanks to her fae heritage and young age. Her wings are mothlike, starting at her shoulderblades and ending at her upper-thighs; the top layer hides the lower one completely unless she spreads them. They're similar to those of a Primrose moth; the upper wings are cream-coloured at the shoulderblades and the very bottom of the wings, while a soft pinkish colour in the middle; the lower wings are a slightly off-white all over. For the most part, she hides them beneath her clothes.